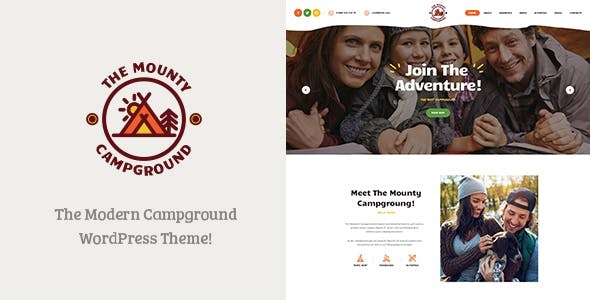 The Mounty is a modern & alluring Camping WordPress Theme built for campgrounds, camping, children camps and kids activity center company. It will be perfect for campers, packing instructions business, hiking agency, events firm, campers’ blog, child sports solutions, rent camping facility services. It fits any water camp, art camp, nature camp, hiking trip, as it has awesome registration and booking functionality. It is great for children communication classes and children blog, and even an online store of hiking equipment and accessories. This WordPress theme is compatible with such popular plugins, as WPBakery Page Builder, Revolution Slider, Essential Grid, Booked Appointments, Events Calendar, and WooCommerce. It’s based on the powerful framework and made fully responsive, so that your website would look perfect on any device, from Android smartphone to Retina display. Besides, it has everything to get highly ranked in search engines due to 100% SEO readiness.